Go To Team wrapped up one of their biggest shoots of the year last week as Fox begins their NASCAR coverage. It’s Go To Team’s fourth year on the “Hangar Shoot” and every year it’s getting bigger while we get to make REALLY cool tv! 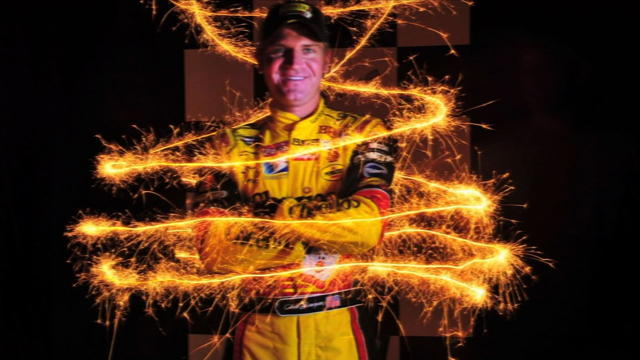 Fox Sports uses the week before the Bud Shootout every year to shoot artwork, headshots, and content that will make up intros andoutros as well interstitials that will air throughout the season. 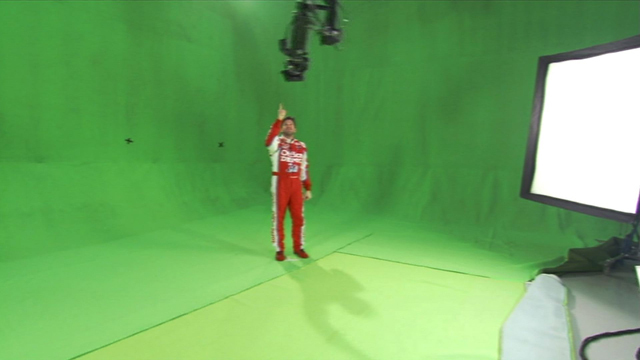 Since all the drivers are right there at the track, Fox rents out an entire hangar at the airport behind the track and that becomes the studio! There were eight sets inside the hangar and a bonus set just outside that was designed to look like a Hollywood set. The whole shoot is a big teamwork kind of project with EFP crew from Fox Sports coming together with DPs from Go To Team, California, New York, as well as the local Florida area and a big Grip and Electric crew from all around Florida. Go To Team’s Skip Clark (Charlotte, NC Crew) headed up the Phantom Camera room that was designed to re- create Victory Lane. 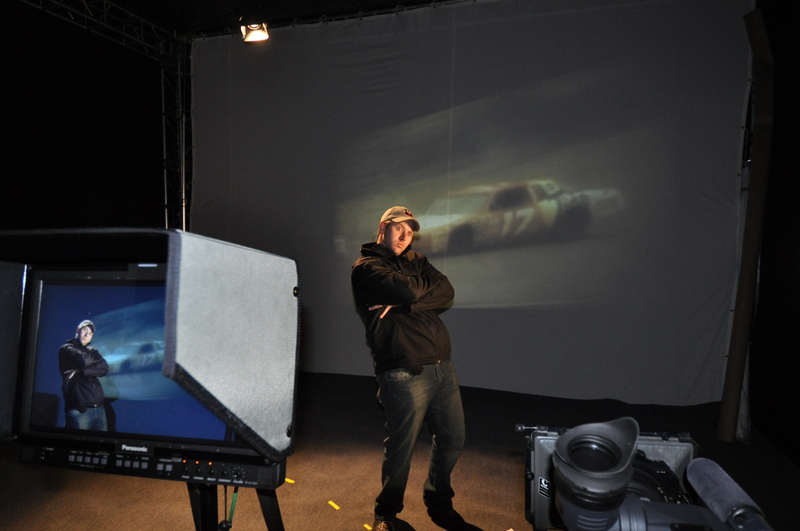 The phantom creates amazing footage… we’ll do a full blog about it later. Tom Wells (Go To Team’s Charleston, SC Crew) took the drivers out of their cars and put them on a rock concert stage, but with Guitar Hero! 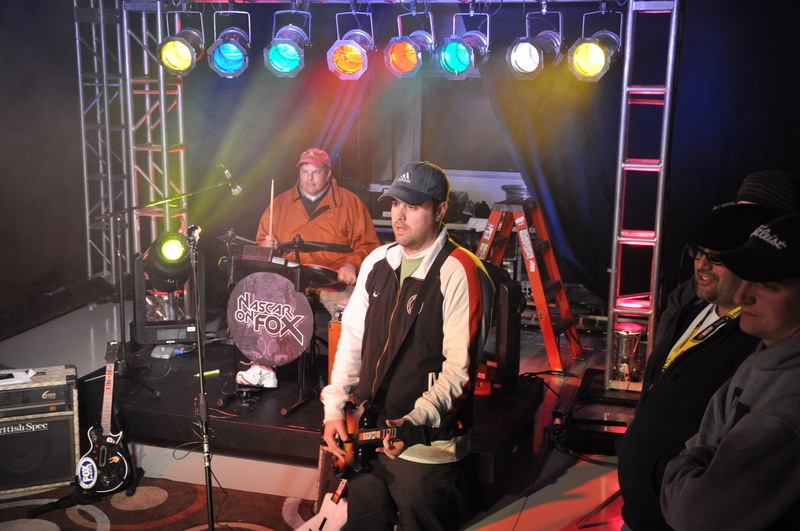 The room was complete with truss, moving lights, and 60″ Plasma TV. If you haven’t played Guitar Hero like this… we highly recommend it. Again, this could be its own blog post. 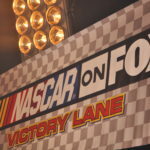 Fox Sports will use the Red Carpet footage to put the NASCAR drivers at the Oscars the Sunday night when the race is in Fontana, California. 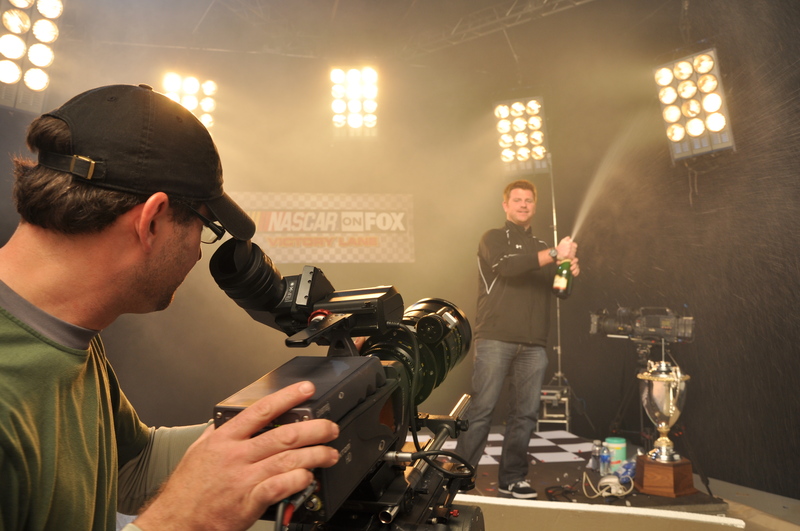 Outside, Fox Sports brought along John Slagle to set up a little Hollywood movie set where the drivers got to fill our positions behind the camera! 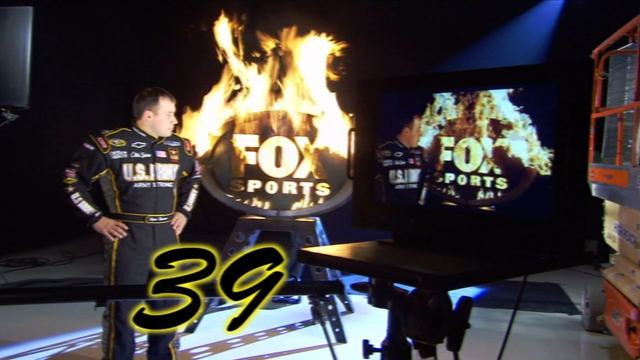 Chris Bierlein took a Fox Sports sign rigged with pyrotechnics and made it super cool with some great lighting and all the drivers made a stop in the Fire Room for some tough guy poses. 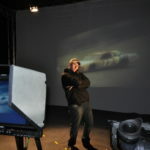 And if all that wasn’t enough to keep all the drivers busy with their time at the hangar, there were two interactive photo stops for them: an iMac room using the Photo Booth program and Corey Brosius’ photo room where he used timed exposures to paint light all around the driver (if you haven’t tried this at home, it’s easy to put together with some flashlights and any camera that can do time exposures – but Corey made it beautiful!). And last, but not least, was the soundbytes room; it was a simple set with a projector and some bleached white muslin for a screen. Tom Wells did a great job creating a dramatic look with just a couple of lights without taking away from the projected image on the background. The whole shoot was quite an undertaking and none of it would have worked without everyone jumping on the team, pitching in, and working long hours. 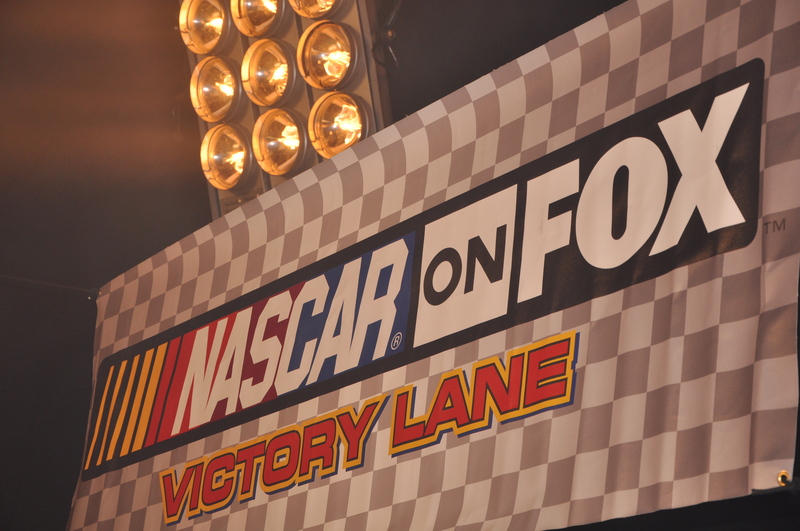 Be sure to check out the clip on-line and then look for all the footage to air throughout the NASCAR season on Fox Sports!